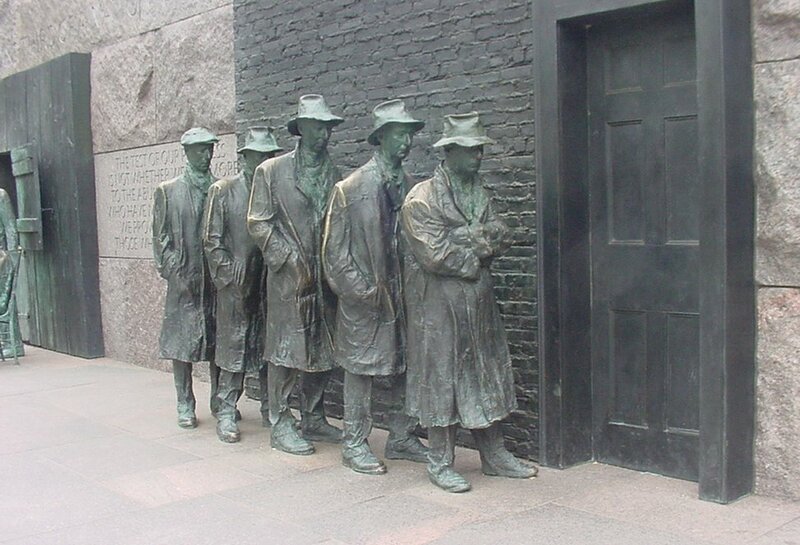 Certainly anyone who lived through the Great Depression and may have had to wait in lines for hours at a time for petty things like food or a job must be shocked at how bad this economy is today. People who are younger like me and the generation before me will remember the gas lines of the 70's and the odd/even purchasing system and the double digit inflation during that same time. But seeing that picture above of that line in Miami, well, I never thought things would come to this. 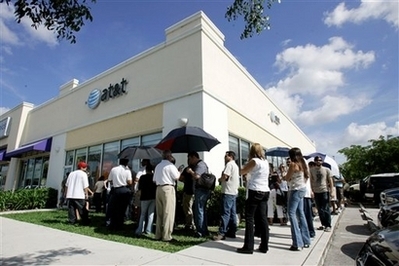 I think someone in the media should poll some of those people wait in those lines for toys like iPhones or PlayStations and ask them who they think should pay for their health insurance or what they think of $4.15/gallon gasoline. Sure, they may say that the government should cover their health benefits or they may say ExxonMobil is evil but they have no problem reverse-cadging Apple and AT&T and handing them their money, but, hey "I want an iPhone. Gimme gimme gimme gimme. Let the government pay for my health care, I just spent my monthly premium on an iPhone. I can't afford to fill my car but I can afford an iPhone and monthly service contract." Nonetheless, people certainly have the right to spend their time and money as they please. I just don't get it, though. All levels of government do a good enough job taking my money and the best part is that I don't have to wait in line for them to do it. If you are one of those who do wait in lines for gadgets, just take a moment to think and be thankful that today in America, images like this, only exist in statues. Iran Missile Launch Pic Photoshopped? Making the rounds on the usual blogs this morning I found this post that claims a photo released by Iran showing some missiles launching was Photoshopped. Judge for yourself. Update (07/11): The MSM finally catches on; two days late. For the first time since around 1990, I actually bought a pair of pants (shorts, actually) with a 32" waist. I fit into them. I also bought two medium shirts, too. Many of my clothes are now too big for me. I guess losing 22 pounds will do that to you. Enjoy your Fourth of July holiday. Looks like a rainy one locally; hard to say if they'll be able to fit the local fireworks shows in. I hope they can but it's too early in the day to tell. Take a few minutes today to read the Declaration of Independence. I read it about 2-3 times a year and learn something from it each and every time. A man who thinks of himself as belonging to a particular national group in America has not yet become an American. At least in part. Let's practice some restraint out there. If you read my blog you know how I feel about air conditioning. The last thing we want is the government regulating our energy usage. Laugh if you will, but it's coming. Yes, A/C may only contribute to 4% of our energy usage but, still, cutting down the luxuries (A/C is a luxury, not a necessity in most homes; especially in the northern half of the country) is a good way to reduce some energy consumption. A little here and a little there can indeed add up.